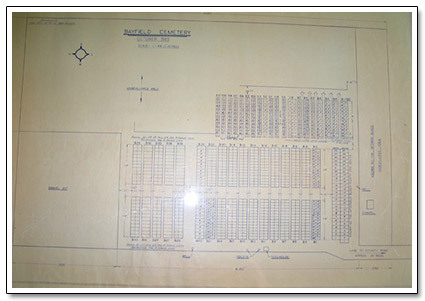 The Bayfield Cemetery was established in December of 1861 when Stanley Township Clerk, John Esson, bought an acre of land from Andrew Bronson. Bronson purchased the first burial plot for $3 and then the land was divided into shares. Buying an initial 10 shares were: James Gairdner, Andrew Rutledge, Thomas H. Bateman, William H. Hall, William W. Connor, William Bengough, James Thompson & Co., and George Erwin. 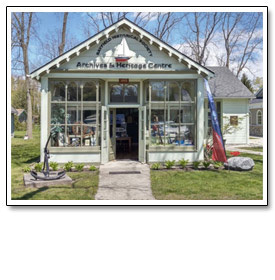 Information is from the Corporation of The Village of Bayfield History 1876-1985 by The Bayfield Historical Society. Records for the following cemeteries are available for viewing at the archives. 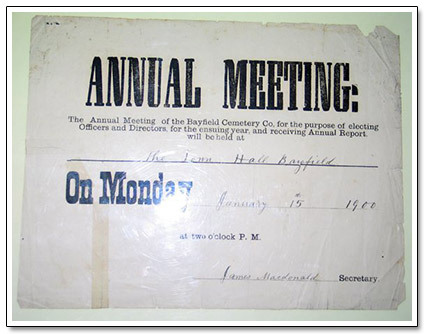 Recording and updating the cemetery records is an ongoing project. If you would like to assist us in updating records, volunteers are always appreciated. Please email us if you are interested.